UPDATE: we've now published our full and in-depth review of Canon IXUS 200 IS. TechRadar has just come back from an exclusive Canon event in London, where the company showed off its latest range of cameras.The one shooter that we made a bee-line for was the Canon IXUS 200 IS. Canon's IXUS range has always been about style, and its 200 IS range doesn't disappoint. It features a similar curved chassis that was last seen on its predecessor, the IXUS 110 IS, and under the bonnet the specifications are surprisingly similar. Sensor-wise, there's 12.1 megapixels of power to contend with, while there's a 5.0x wide (28mm) zoom and optical IS – this is one increment up from the 110 IS. The size of the screen on the back has also increased. Instead of 2.8 inches, there's now a 3-inch LCD that's also widescreen, so great for playing back movies on. Recording movies is one of the features that is available on the IXUS 200 IS. Shooting at 720p, films can then be played back on the screen or attach a mini HDMI lead to the camera, you can then hook it up to an HD TV and away you go. While we were wondering if the camera was a little on the chunky side when we got the press shots through, it turns out that the IXUS 200 IS fits in the hand nicely; its curved facia friendly to the fingers, so you shouldn't have any problems with stray digits getting in front of the retractable lens when taking a photo. Flip the camera around and you will see that the touchscreen doesn't actually stretch to the whole of the back. This is something Sony likes to do with its compact touchscreen cameras, which means that everything is done with finger prods. Canon has decided against this and kept a jog dial, so this means that if you don't fancy searching through myriad menu options with your fingers, then the dial can be used. This is a good thing on Canon's part but it does also mean that the camera's features aren't fully enabled via touch. Delve deeper into the camera settings and things like changing the time and brightness have to be tweaked via the jog dial. When used, the touch 'buttons' are extremely responsive, however – something that most compacts have yet to master. We spoke to Canon about the 'selective' touch options and they informed us that it was better that it was only the main features that could be changed through touch as you are less likely get lost in myriad menus. While this is a valid point, it does mean you have to be slightly dextrous with your pointing at the screen and flicking of the mode dial. It also means that you will occasionally prod the screen thinking it is touch enabled, only for nothing to happen. 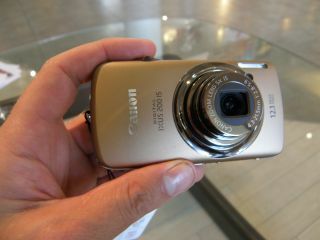 With 22 scene modes on offer, the Canon IXUS 200 IS is definitely a camera for the casual snapper. Sleek and stylish it will look good in any pocket – the gold coloured version we played with was especially nice to look at – and with a powerful sensor and generous optical zoom, the images are bound to impress. While we couldn't test the camera on its image capabilities or delve as much as wanted to into the machinations of the device, the IXUS 200 IS impressed us – even if it wasn't as touchy feely as we would have quite wanted. The Canon IXUS 200 IS is available from early September 2009 priced at £329. For more information, go to www.canon.co.uk.